← Off To The Races? My friend is a movie star. If she heard me say that she would probably whack me across the arm and say ” a movie extra”, but she’s a “Movie Star” in my eyes. Last night I was privileged to be invited along to the premier of a movie my friend was an extra in. It was an evening that felt like a comedy that I was playing one of the main characters in. My day starts with a full appointment book and I had to get away in time to drive to Kangaroo Point in Brisbane City to meet my friend and 2 other girlfriends. From here we planned to depart via taxi to the pre-party, movie premier and after party event. I get away late to start with but without any delays, I should make it just on time. Recently changing my mobile telephone service provider to another carrier I considered to have better coverage, I chose to leave my Garmin navigator at home and put the address into Google maps navigation on my phone. The navigator took me into the airportlink M7 tunnel at Nundah which is an outer suburb on Brisbane’s north-side. A few kilometres into the tunnel I realised the kilometres on the navigator hadn’t changed. Lost signal! I don’t know my way around the city very well and don’t like city driving. I missed my exit and ended up travelling under Brisbane City popping out somewhere on the other side. Navigator recalculated and took me right through the middle of Brisbane city at 5.30pm Friday afternoon. 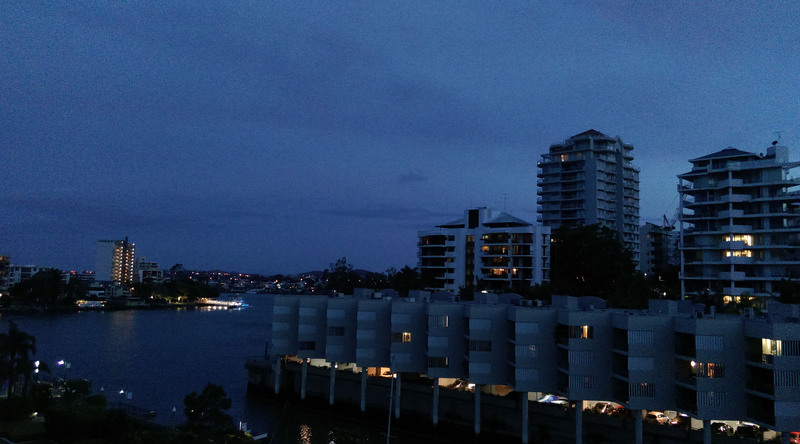 I got to Kangaroo Point Apartments, parked my car and walk down to the Story Bridge Hotel to meet up with the girls. Along the way I checked my phone and read a rather garbled message from my friend. My friend has been improving her health with a change of diet and no alcohol for quite some time but today had consumed a few, quite a few, way too many drinks and was smashed when I arrive. Undress, shower, dress, coffee, taxi. Thank goodness the movie had already started. Friend staggers in under the cover of darkness. Friend has the duration of the film to sober up. After party? Are you kidding? I’m not going to let her near another drink. No arguments from her. She’s ready for bed. Another event where taking loads of pics was not appropriate. This entry was posted in Australia, Comedy, Movies, Photography and tagged Brisbane City, Carlos Santana, Comedy, Google Maps, Kangaroo Point, Movie Star, Movies, The Story Bridge Hotel. Bookmark the permalink. Ahh yes. The Clem 7. Got to love it right? I really do rely on landmarks to make my way around. It was so easy to miss the exit sign in the tunnel. My bad, I should have taken a look a the rout before I left anyway. I mostly, but not always, pre-plan and sometimes have even driven the rout a day or two before an important meeting or event. Another “wild-google chase” courtesy of google maps! Thanks for stopping by Sophie, I took my son along. He was learning the guitar and I was hoping to inspire him. His older sisters weren’t that interested which was a shame. They missed out on something special.